Cuyahoga Falls writer Laura Freeman returns to her fictional Western Reserve town of Darrow Falls for Impending Love and Death, second in her “Impending Love” series set around the time of the Civil War. In the first book, Impending Love and War, schoolteacher Courtney “Cory” Beecher and Tyler Montgomery went to great lengths to help a free black man who was being chased by slave catchers. In Love and Death, Cory and Tyler are married and expecting, and Cory’s sister Jennifer “Jem” Collins meets up with Logan Pierce. Actually, she almost runs him down in the street with her buggy. Logan works for Salmon P. Chase, secretary of the Treasury in the Lincoln Administration and future face of the $10,000 bill. He has come from Washington to ask Tyler, a lawyer, to write letters to newspapers to build support for making a new state out of western Virginia. Jem is a newlywed, nervous because she hasn’t received a letter from her husband, Ben. They’d been married only a month when he and two friends volunteered for a 90-day enlistment period. She learns that one of the friends, John, was wounded, but there is no news of Ben or Herman. Jem decides waiting around is senseless, so she decides to go to Washington City herself to find out what has become of Ben. She asks Logan to recommend a boarding house, and he refuses, telling her to stay home. Still, he does assist her, despite his reservations about associating with a married woman, and together and separately they go to the battlefield and behind enemy lines to learn the truth. The romance isn’t as spicy as in Love and War, and there isn’t as much joking around, but the scenes where Logan talks to young veterans of the First Battle of Bull Run, and Jem organizes the cleaning of an entire makeshift hospital ward in an afternoon, are powerful and convincing. 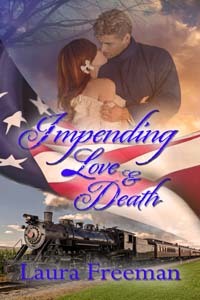 Impending Love and Death (360 pages) costs $16.99 from Wild Rose Press. Laura Freeman works for the Record Publishing Co.
“A Red, Red Rose” by Susan Green is written in the voice of the heroine, a twenty-year-old wannabe writer and sounds authentic as she struggles to understand the mystery surrounding her family and whether or not the strange happenings are due to a ghost or a vengeful relative. The story is told in first person, and the “I saw” and “I thought” were a bit heavy handed in the beginning but were less noticeable later on. Detailed description helped to create the setting of a Southern plantation, and the characters were interesting and likeable. The plotting was steady with a tense-filled climax. I would recommend the book for anyone who likes romance, a cozy mystery or a Southern Gothic ghost story. “Blue Violet” by Abigail Owen at http://goo.gl/IFJ6mx uses the fantasy/paranormal genre to tell the story of two siblings with special powers they must use to save others like them. It balances a story of human emotions with supernatural encounters. The secret of their powers and mission keep the characters apart until they must bond to defeat the enemy. The romance reflects the emotional turmoil the characters face. Normally not a fan of fantasy/paranormal genre, this story won me over. If you’re looking to expand your genre taste, this one should be on your list to read.